Eastern European Charm and Ten-Layer Honey-Cake! If only Gough Street were paved with cobblestones and lined with vintage European cars, then the Old World ambience of 20th Century Cafe would be complete. When you walk into this cafe, you half expect the hostess to start speaking with a foreign accent. Visiting 20th Century Cafe is like a mini vacation, it's an escape to another world. 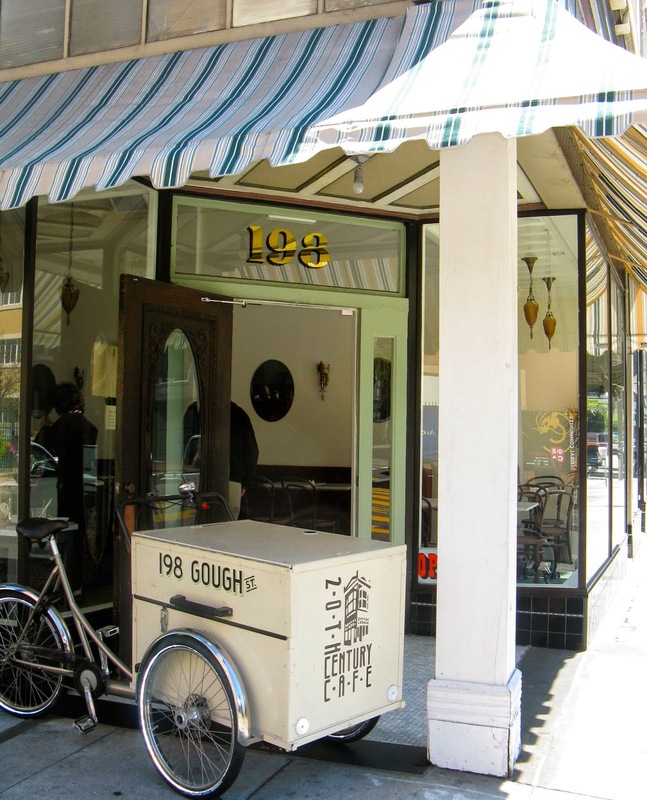 You are far, far away from the typical grunge San Francisco coffee shop. By contrast, 20th Century Cafe has a gorgeous interior decorated with exquisite attention to detail. From the marble tables to the Art Deco light fixtures, everything is beautiful. The cafe also uses elegant porcelain cups and plates along with polished silverware. 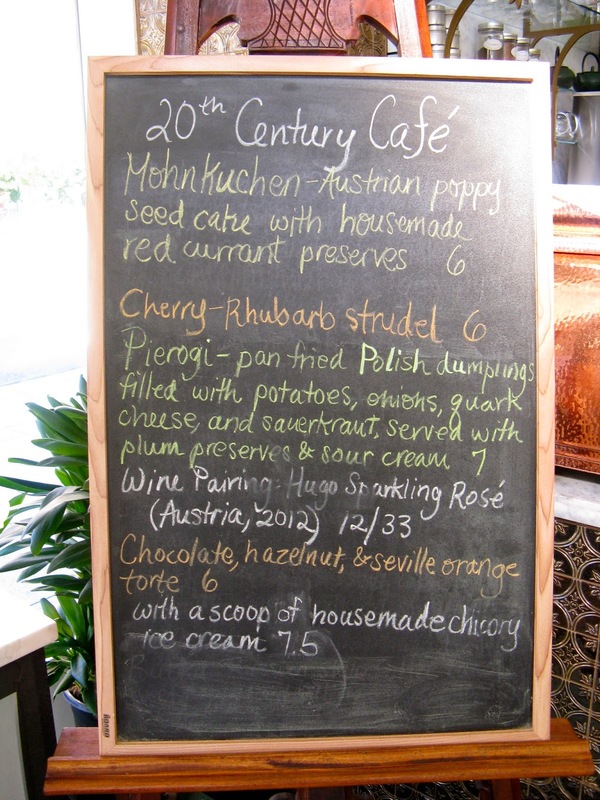 20th Century Cafe specializes in Eastern European baked goods such as pierogi and strudel. Chef-owner Michelle Polzine was inspired by her travels through Budapest, Prague and Vienna, and she scoured antique cookbooks to find the perfect recipes. The cafe's friendly waitresses also dress to fit the part, in charming 1940s outfits. The bakery counter at 20th Century Cafe showcases a selection of Eastern European baked goods and pastries including house-made bagels, babka, pierogi, potato knish, Sacher Torte and linzertorte. The cafe also offers lunch specials such as Hungarian Chicken Salad Sandwich, Reuben Sandwich and Cream of Garlic Soup. The pièce de résistance at 20th Century Cafe is the Russian Honey Cake (Krasinski Torte). This amazing ten-layer creation features a caramelized honey mousse alternating with fluffy genoise cake. Even though the cake appears indulgent, it's surprisingly light. To make the Russian Honey Cake, the cafe uses exceptionally fragrant honey. When the baking staff first starting preparing this cake in their kitchen, they noticed that the caramelization process was attracting local bees. So now they only prepare the cake at night when the neighborhood bees are off duty. 20th Century Cafe specializes in classic Easter European tortes (layer cakes). On the day of this blogger's visit, the cafe was offering a hazelnut torte. This dessert featured layers of moist hazelnut cake alternating with delicate Seville Orange marmalade, glazed with bittersweet chocolate ganache and served with a dollop of whipped cream. 20th Century Cafe is a great place to spend some quiet time, read a book or catch up with friends, while enjoying a leisurely lunch or dessert and coffee break. Treat yourself to an afternoon spent in grand European style!